Our reviewers pick their Top Ten favorites of 2000 in this month's Pick Hit. 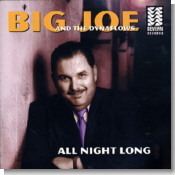 Few cats can swing as well as Maryland drummer and singer Big Joe Maher. They say he can do it All Night Long, the title of our January Surprise feature. Rooster Blues Records takes on a trip back to the storied days of Chicago blues with the special album And This Is Maxwell Street, featured as this month's Flashback selection. This month's What's New section features reviews of new CDs from Willie King, Roy Gaines, Etta James, Marva Wright, Ernie Hawkins, Michael Coleman, Jimmy Smith, Howard and the White Boys, and more, as well as retrospectives on the careers of Los Lobos and Stevie Ray Vaughan.